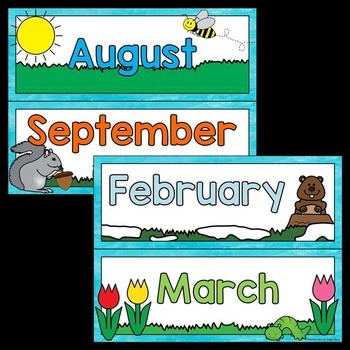 This set is designed to be used in a calendar pocket chart (not included) and has materials to last all year. 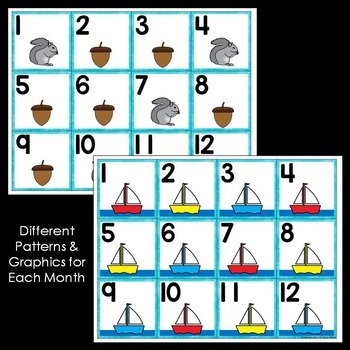 Date cards with seasonal graphics have various patterns to integrate problem solving into your calendar math time. The month and date cards have seasonal images, but are not holiday specific. I have included 31 cards for each month so you can mix and match as you wish. 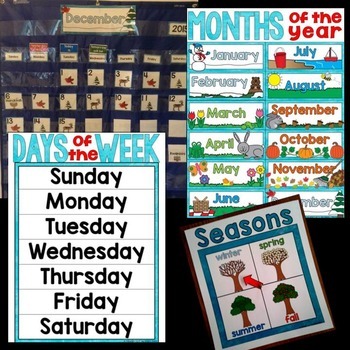 Other supplemental materials such as a 100 chart, a season spinner, and “days of the week” and “months of the year” posters make this a complete calendar set. 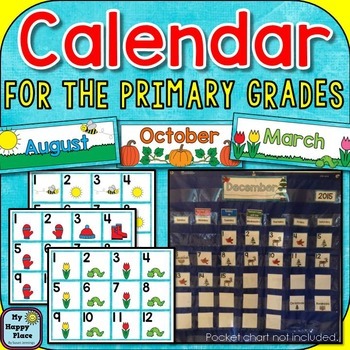 This calendar set is designed to fit into a standard calendar pocket chart. The pocket chart is not included. the “Back to School” category in my store.. Please see the preview file for more detailed images. If you have any questions, you can use the “Ask a Question” feature on my store page or email me at MyHappyPlaceTeachingProducts@gmail.com.